Jim - We have to be much more imaginative than assuming that if aliens exists then they are all sentient, intelligent, and look like us. Jim - What we're really looking for is any evidence that life exists, or did exist somewhere else other than Earth. Graihagh - And what do you mean when you say you're "looking for evidence" - what is the evidence that might be out there? Jim - Well, one way is point our radio telescopes to listen out for signals from space. After all, we've been broadcasting our presence into the universe ever since we invented radio and television a hundred years ago. So, whether it's an accidental or deliberate signal from any alien civilisation, we're listening out for those signals. So this is what SETI, the Search for Extraterrestrial Intelligence is all about, but that is looking at life that is advanced enough to become technologically able to send out signals. Graihagh - But what if you're not technologically able to send out signals - what if you've akin to a dolphin or a microbe? Jim - Of course, there's also another strand which is looking for the signatures of life elsewhere in planets, in other star systems - extrasolar planets they're called. And we hear in the news now, in the scientific news almost weekly of a discovery of another so-called Earth-like planet. Graihagh - In fact, do you remember Carol Haswell? Carol - I'm an astrophysicist at the Open University where I do research on exoplanets. Graihagh - She was on Naked Astronomy back in April talking about her love of exoplanets - planets around other stars or what Jim calls extrasolar planets - kinda a tomato / tomato scenario. Jim - It means we've found another planet which we think could be like Earth. 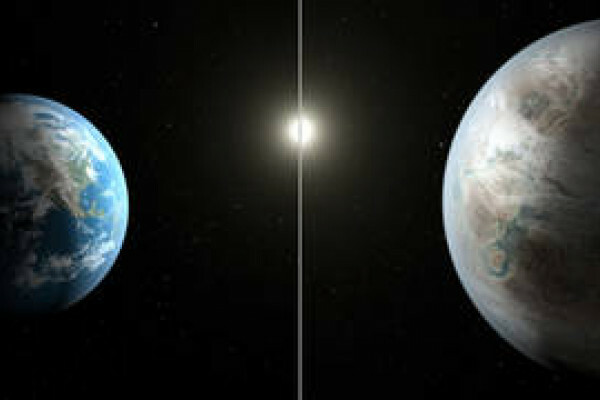 It might be at the right distance from it's star so that water can exist in liquid form, it might have an atmosphere and, therefore, it could, potentially, harbour life. But what's really exciting now is that we have the ability to, just by studying the light coming from a star that could pass through the atmosphere of a planet going around that star, that light could carry with it a signature of molecules that could only have been created if life was there. So, certain types of organic molecules, or the presence of oxygen, or isotopes of carbon. There are certain chemicals that don't occur naturally that can only be created by living organisms. Graihagh - But I suppose we're using quite different techniques there as we are to looking at extrasolar planets? Jim - That's right. With Mars we can actually send probes there and, if they land safely - Mars Rover is still busy - then they can look at soil samples and really, really study the composition there. We don't believe there's life on Mars now of any form, but there is a strong possibility that Mars did harbour life. Billions of years ago Mars was much more like Earth, it had an atmosphere, the climate was a bit more conducive to live, it was warmer. So life could have existed there and jury is still out on whether life existed there. I do remember back in the 90s, there was a huge surge of excitement when it was thought that we'd found evidence of fossilised microbes in a meteorite that was discovered on Earth that we believe came from Mars. And studying it under an electron microscope it was thought that we could see this fossilised remains of a little organism, and that made headline news around the world. But then, of course, they realised that actually it was some inorganic crystalised structure that could have emerged without any evidence of life, so that was a huge disappointment. Graihagh - We really are trying our darndest to find life somewhere, anywhere. Where is everybody - why are we not being successful in this given how much power and science we're throwing at it? Jim - Yes. You've just quoted the famous Fermi paradox. Enrico Fermi, the Italian nuclear physicist was in Los Alamos in 1950 and he asked that question. That was just after there were lots of stories in the news coming out that people were seeing flying saucers landing and so there was a real buzz of excitement that whether aliens were visiting Earth. Said - "well okay, if the universe is so big, and it's been around for so long, and there's so many stars out there, where is everybody?" Is the fact that we've received nothing but complete silence for the last half century or more really evidence that we are alone and we should just give up hope? But, actually, despite searching for so many decades, we are only sampling a tiny, tiny fraction of what is out there. After all, we are only looking towards star systems that are close enough to us - you know, hundred or so light years away or nearer. That's only our little neighborhood within the Milky Way galaxy. Just because we may never find evidence of life elsewhere doesn't mean there isn't life out there. Just from the laws of probability, the universe is big enough that it must be teaming with life. It's just whether there's anything close enough to us that has evolved and become sentient, and developed civilisations, and developed technology enabling it to send signals out to us. So there are lots of steps along the way that would explain why we've heard nothing yet. Next How big is the Universe?